The panorama roof with power tilt/sliding panel can only be operated when the roller sunblind is open . ■ To open and close: turn the SmartKey to position 1 or 2 in the ignition lock. 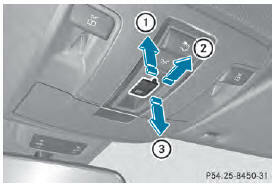 The automatic raising feature is available only when the sliding sunroof is closed.